So you want to build a website? Easy, right?! Well it can be—but not without a project management tool to keep track of multiple tasks, across multiple users. Your shot at Website Success hinges on your choice of project management tool. 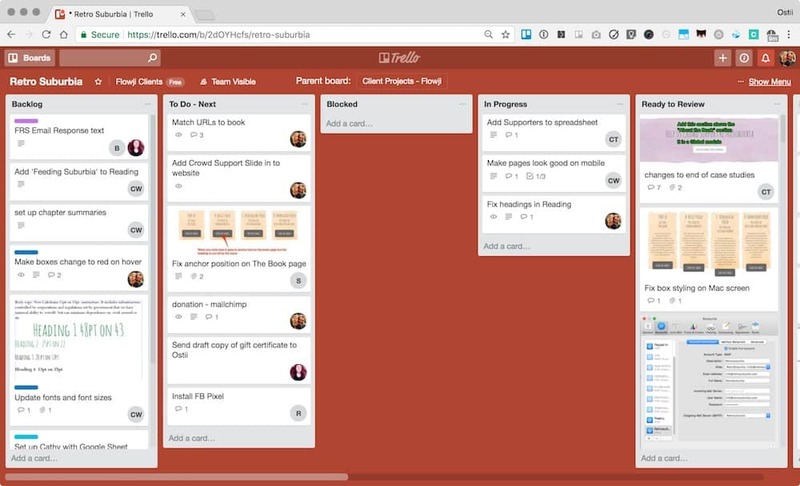 Here at Flowji—and for our Web Liftoff Program participants, our tool of choice is Trello. Trello is free. Trello is awesome. Trello empowers you to track tasks through stages, collaborate on task lists, make comments, and share content—including screenshots and files. 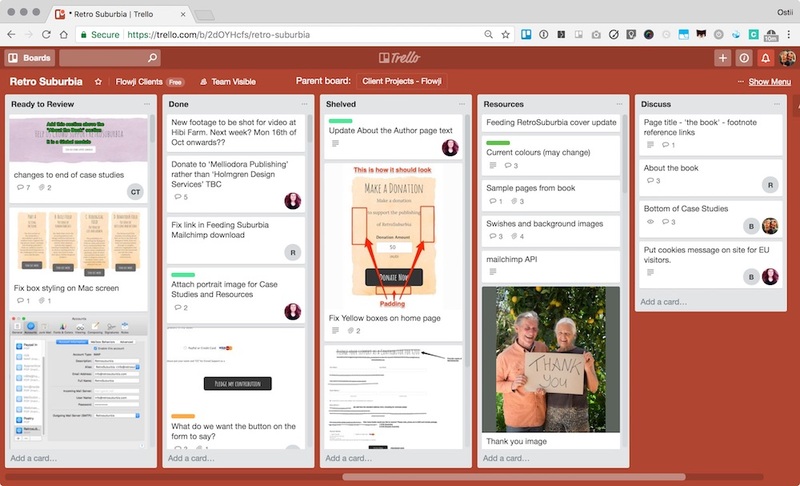 Trello puts your whole website project in one place. No more searching for old attacments through emails. No more mixed up versions wasting your time and energy. No more confusion and wasted energy. The whole thing is called a Trello ‘Board’. Each column on the Board is called a ‘List’. Each List contains a bunch of ‘Cards’ which describe separate tasks. 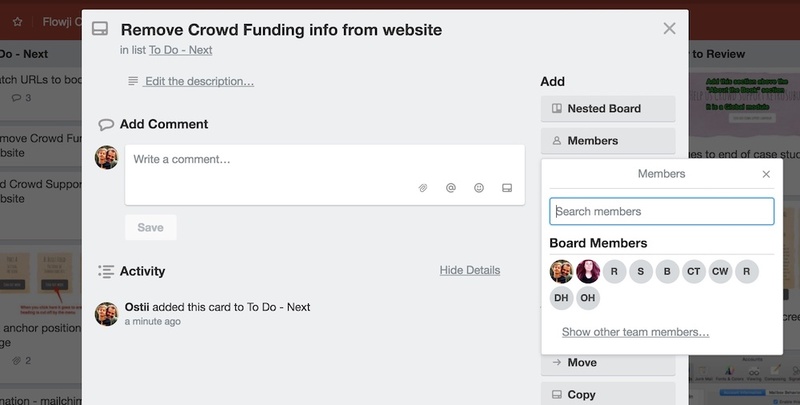 You choose how detailed to get with each Card, and each Card can hold a huge amount of information including files, links, screenshots, checklists, and messages from your collaborators—so it really puts all your resources in one place. The above Trello Board is for the launch of David Holmgren’s Retro Suburbia website. With ten team members working across four locations to create this website in a month, a single point of reference for all tasks, discussions and issues reduced confusion and allowed the website to be launched without stress and conflict. We planned and built the website using the Flowji Way—which is avaiulable as a step-by-step guide in our No form found . As we saw above, the columns that we call ‘Lists’ in Trello are the first layer of categorising the tasks in your website project. Click on the thumbnails below to drill down into how we’ve used Lists on a real-life website creation project. We all do our best work when standing on the shoulders of giants—so start by naming your Trello Lists in the tradition of The Flowji Way. We’ve found it the most empowering way to categorise yoru tasks across hundreds of web projects. Backlog is a software development term used in Agile Methodology. It’s supposed to be a list of all the desired features for your website, however, for a simple website, you can use it as the catch-all for everything to do with completion and launch. Any time you think of a new task, add it to ‘Backlog’. The idea is to drag things from ‘Backlog’ to ‘Up Next’ as you are ready to start work on them. Review Lists regularly, and order items by importance from top to bottom. This List contains the tasks you plan to work on next—the most important tasks that you need to do to complete your website and launch it. Try to keep this list to between five and ten items. Each item should have a team member attached to it, and preferably a due date. For more complex projects add a column for ‘To Do – Urgent’. Or follow more of an Agile methodology and add a column for each sprint. This tells you who’s waiting on something to be able to keep working—and so it’s the first and best column to look at each work session. Whoever’s blocked, work out the next steps ‘unblock’ the task, and clear the critical pathway. Sometimes tasks have to sit here for a time while you wait on resources or input from your graphic designer, copywriter or website mentor [LINK]. This List is just what it says: all work that’s in progress and unblocked. It’s usually the second list you check—right after checking the ‘Blocked’ column. Get in the habit of dragging all active tasks into this column. Don’t leave them in the ‘To Do – Next’ column once you’ve begun work on them. Once a task is complete, it’s dragged to the ‘Ready to Review’ List. If you’re working on your website solo, you may want to drag it straight to the ‘Done’ List—but we recommend using this List and reviewing your own work before moving it to ‘Done’. If you’re part of a team, this is a great way to ensure the quality of all the work. We all love ticking things off our To Do list! So when the task is completed and reviewed, drag it to the ‘Done’ List. Some people prefer to archive completed tasks, but moving them to the done List shows your website creation progress. 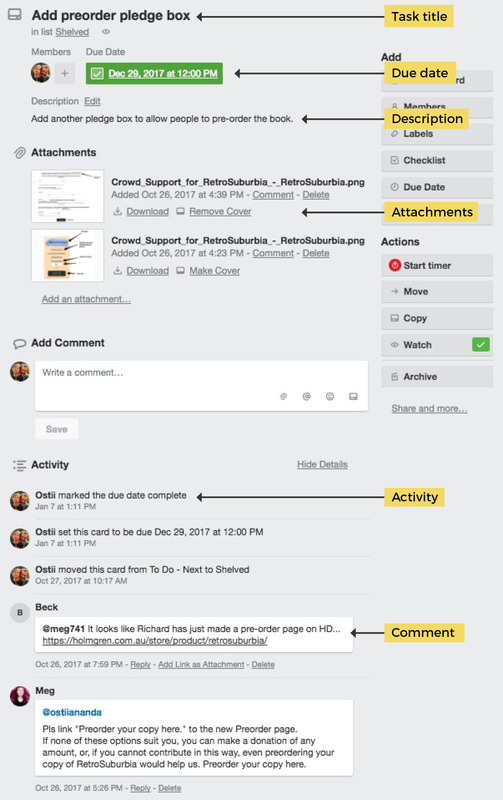 You can also then refer back to completed tasks quickly and easily. Use this List for features that you decide not to implement. Use the comments section to note why the item was shelved. This List can become the basis for the almost inevitable ‘Round 2’ of website creation that happens sometime after your key deadlines. The ‘Discuss’ List includes any ideas or tasks that need clarification. There is generally not a lot in this List when you begin creating your website, but it pretty quickly fills up—especially if you’re collaborating with a designer, copywriter or other team members. Use the Resources List to store links to any files that aren’t already linked to particular Trello Cards—including any files that need to be accessed throughout the life of the project. While Trello is the central place that your tasks and resources are cross-referenced, Flowji recommends using Google Drive as the long-term storage, and access them via links on the Trello card. 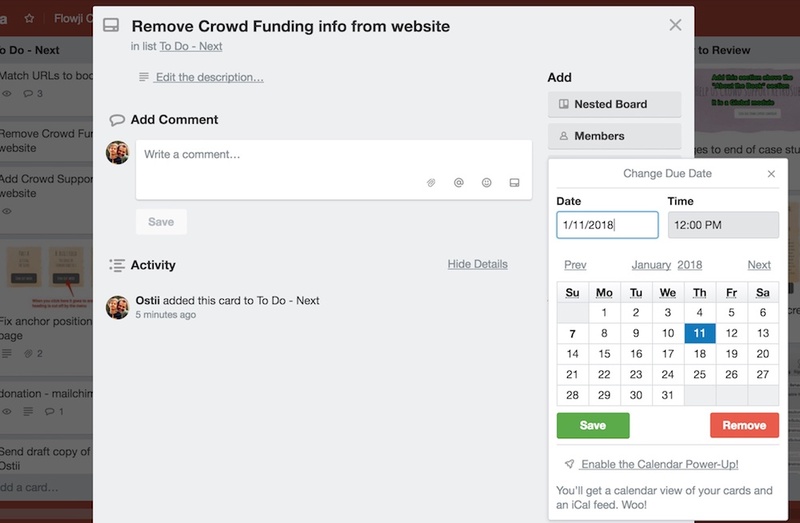 Within your Lists, you create a Trello ‘Card’ for each task or feature of your website build. In the image below you can see the Cards for the ‘Backlog’ and ‘To Do – Next’ Lists for the Retro Suburbia website. To move a Card from one stage to the next simply drag the card to the next List. Really, these tips apply to any project management system you are using. 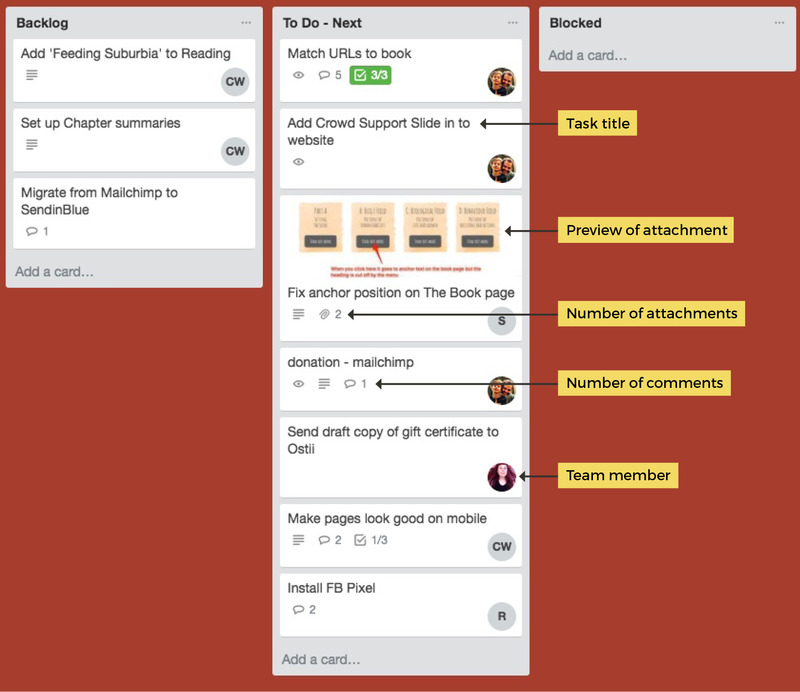 And if you want more, here is a great article on how to use Trello like a pro. There are a tonne of other project management tools you could use to support you to create a rockin website. Here are a few more. Wrike Airtable To see more tools to help you on your journey to website mastery, visit our website resources [LINK]. Asana is also great. And now that they have the Kanban (boards) option for projects you can manage a project very similar to how I have outlined above.